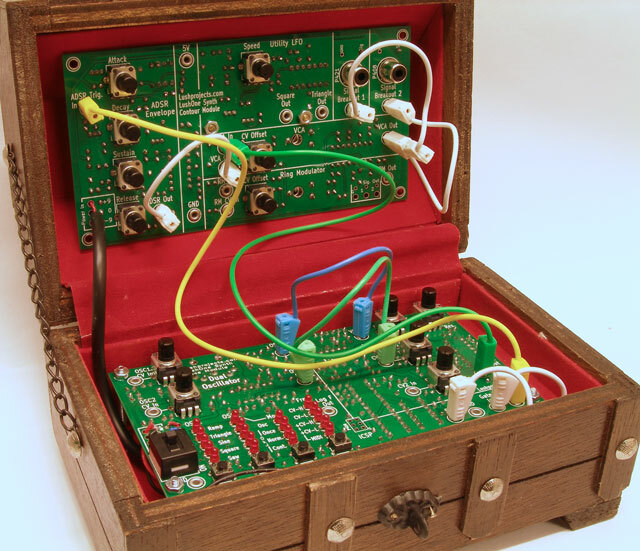 A synthesizer built in a miniature treasure chest. What could be nicer? Last year my girlfriend's parents uttered the dreaded phrase "we're clearing out your stuff". As a result we acquired a large number of music mags (sold to an enthusiast on eBay), a guitar and various bits and bobs including a jewelry box in the shape of a treasure chest. The last item caught my eye because I knew it would be perfect for something. I spent most of 2012 working on bringing the LushOne synthesizer kit together and now the first two modules are designed I've been itching to use them in my own projects. The LushOne is a cost reduced patchable synthesizer with an analog filter and effects. As well as being low cost the LushOne is also very compact which opens possibilities to use it for interesting case-mod projects. By a massive fluke the LushOne boards fit perfectly in the treasure chest with just enough room for two PP3 batteries to power it. The components can be patched together to create many different effects. The biggest challenge was how to mount the LushOne Contour board in the lid of the box. It just fits but has to be fitted in with the sloping sides of the box. After various experiments it became clear that using the normal corner mounting holes was going to be a very ugly solution even if I could find a way to do it. After a lot of head scratching I found a way to mount the board nicely. Using stand-offs near the horizontal centre axis of the board I can attach it to the lid on a using the horizontal top face of the chest. Amazingly I was able to find two points on the board where I could drill to create new mounting holes without damaging the circuit. Two holes doesn't sound a lot but it feels secure and looks really neat. Everything else just fits really nicely. 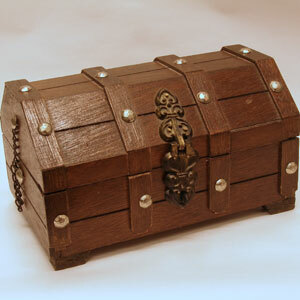 The main module fits in the bottom on long-stand offs from the base of the chest. A hole cut in the back of the chest provides access to the MIDI socket and the space in front of the board is just right to take the batteries. 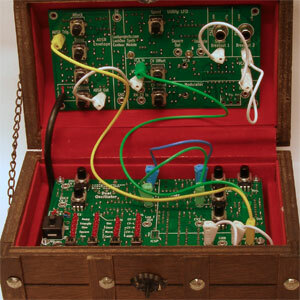 The Treasure Chest Synth is one of those projects that exceeds your expectations when it is finished. One unexpected (and unplanned) advantage is there is just enough height to close the lid even when the patch leads are in so you can carry it around fully configured. It looks great and the compact format is very usable.